These two hats are my contribution for the Baby/Toddler Hat Swap on Craftster. 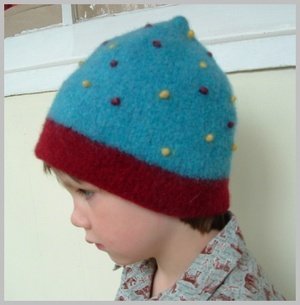 The first hat is a knit and felted hat pattern from Pick Up Sticks. It's such a fun pattern, and using size 10's and worsted weight yarn (this is Cascade 220), it whips up in no time at all. I used french knots for the dots. 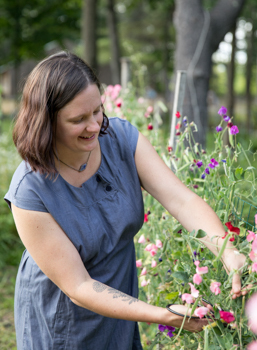 I made one of these for Ezra this winter, and I just love it (and he even does too!). 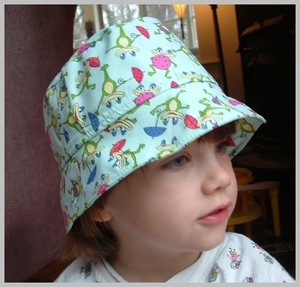 The second hat is the same hat pattern that I've been using lately to make kids hats with (and similar adult hats are coming soon with yummy Amy Butler fabric! ), modified a bit each time until I can finally get it "just right".